Do we really need another anthology of Cthulhu mythos stories? Haven’t we seen all the possible permutations of Lovecraft’s ideas? The four authors of the novellas included in this new anthology would argue that there’s still room for more great stories about the Cthulhu mythos, and I would agree. Like the first two CTHULHU UNBOUND collections from Permuted Press, this third volume features “cross-genre” stories in which Lovecraftian horror is mixed with other genres to produce entirely new amalgams. In the case of the four novellas included here, we have Lovecraft mixed with a western, present-day psychological weirdness, a gritty prison drama, and a technothriller. Mild plot spoilers for each of the stories follow. UNSEEN EMPIRE: Cody Goodfellow has blended the Cthulhu Mythos with a classic Western in this tale of a half-Commanche bounty hunter (who also appears in the chapbook “Black Wind” by Perilous Press) who runs afoul of something terrible as he searches for some people missing from an Indian reservation. It’s got monsters, a lost underground city from an ancient civilization, and the Oklahoma badlands. What more could you want? Goodfellow does such a good job with that one that I enjoyed it immensely, despite not even particularly liking some Western tropes. MIRRORRORRIM: Snell has given us a story about the only male member of a therapy group for self-mutilators who soon realizes that the other members of the group – and perhaps even himself – are far more than they initially appear. The story is reminiscent of both the New Weird fiction and an old David Cronenberg movie, especially since it focuses heavily on body horror. I personally found MIRRORRORRIM to be the least successful of the four novellas – though I did enjoy it and found it satisfyingly creepy in a number of places – because I tend not to prefer stories that rely on horrifying weirdness where it’s not entirely clear exactly what’s going on. Deliberate obfuscation by an author can work, it’s just not my preferred mode of storytelling. Your mileage may vary. NEMESIS THEORY: Tim Curran has pulled off a masterstroke with this Lovecraftian tale set inside a maximum security prison. One of the inmates, a former leader of a Jonestown-like suicide cult, manages to unsettle even these hardened criminals, then all hell truly breaks loose. Curran provides a great look at what might happen when “the stars are right.” Hint: it’s horrifying almost beyond imagination. I was initially a little skeptical of the premise of NEMESIS THEORY because I was unsure that the panoptical setting of a maximum-security prison would allow enough room for an author to tell a satisfying horror story. But then again, any tale involving something living beyond the outer reaches of our solar system described as the “Million Malignant Minds” has GOT to be good, doesn’t it? This was easily my favorite story in the collection. THE R’LYEH SINGULARITY: Two international men of mystery who routinely deal with supernatural- and espionage-related matters for a variety of intelligence services fight to stop a global catastrophe in the making: a multinational corporation has begun a deep-sea drilling expedition that appears to be waking the sleeping dreamer Cthulhu in R’lyeh. Massive earthquakes and tsunamis affecting the entire Pacific basin have already started and things are only getting worse. One of the two men is Hamilton Peel, a former Australian military intelligence officer who also appears in the collection “The Spiraling Worm” and the chapbook “The Eye of Infinity” by David Conyers. 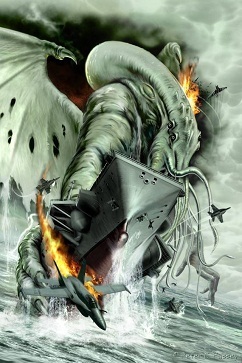 I should note that, just as with the previous Peel tales, THE R’LYEH SINGULARITY is a tie-in with the Delta Green series of novels, stories, and role-playing game books put out by Pagan Press about confrontations between government agencies and Cthulhu set in the modern day. If you like Charles Stross’ “A Colder War” and series beginning with THE ATROCITY ARCHIVES, you’ll already have a sense of what Cthulhu mixed with modern-day techno-thrillers looks like. All in all, I highly recommend CTHULHU UNBOUND 3: it’s a great collection of recent novellas that blend traditional Lovecraftian themes with other genres. I think that if you’re not already a fan of the larger Cthulhu Mythos you wouldn’t get quite as much out of most of these stories (MIRRORRORRIM is one exception to that, it isn’t closely tied in with Lovecraft’s work). If you like the Cthulhu Mythos – unless you’re staunchly opposed to Lovecraft’s ideas being blended with other genres – I think you’ll find a lot to like in this collection. A very good and fair review, Andrew. Thanks for it. BTW: I just got word that the paperback edition of this will soon be out for all those who don’t have eReaders or just prefer a real book to read. That’s great news, Brian! Much as I love ebooks, there’s just something about actual, physical books that makes them seem so much more “real” to me. Hope you guys do a fourth collection!